I am a natural multi-tasker. My life is busy and full, which often means navigating life in multiples: multiple tabs open on my computer; multiple emails, projects, and meetings a day; multiple errands and plans for the weekend. Being able to handle a lot on my plate has its perks, but I came to a point where my brain was foggy. I was going through the motions, but my head wasn’t in the game. I was stuck in react mode. I had a hard time stepping out of the day-to-day and considering the big picture. All of this came to a head a year ago at a planning meeting at work. We were brainstorming about our vision for the next three to five years. My brain couldn’t contribute much. I had a different storm brewing inside me. I felt anxious and stressed that I couldn’t think more broadly. That evening, I did some prayerful reflection about my day. I went back to the meeting. Why did I feel anxious? Why couldn’t I contribute? Answering these questions took a few weeks of thought and prayer. During this time, a friend recommended I read Essentialism, The Disciplined Pursuit of Less. One chapter in and I was not only sold on essentialism, I understood how and why I got to a place of complete brain fog. Multi-tasking was the main culprit! 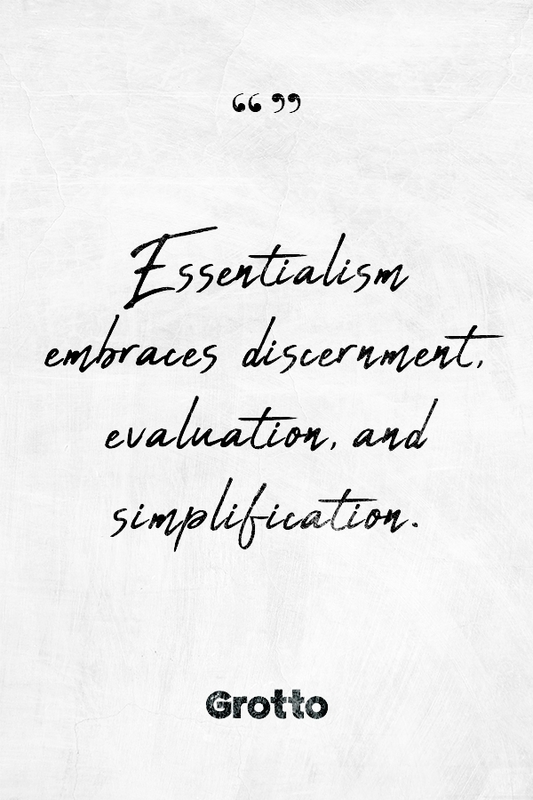 Essentialism embraces discernment, evaluation, and simplification. It rejects multi-tasking — saying yes to everything and doing it all. It’s like Marie Kondo applied to life. Is this the most important thing I should be doing right now? Do I have the resources — emotionally, mentally and physically — to say yes to this? Will this opportunity make a positive or negative impact on the goals for my work, family, and personal life? If we are brave enough to answer honestly, we begin weeding through the “trivial many” and zero in on the “vital few” decisions that will help us thrive in all areas of life. Prior to embracing essentialism, the first task of my work day was responding to emails. This generated a list of tasks I set out to accomplish. My clearest thinking for the day was going to tasks that other people needed done. Then I moved on to my own tasks and meetings. Alas, as the sun set, no time or energy was left for big thinking. Enter essentialism and new routine: Every day, I list the top three to five tasks that will make the highest impact in my work. I begin my day working on those things. I don’t open my email until those tasks are accomplished, or at least in a good place. Additionally, every month I review my goals for the year. I track my progress, make adjustments, and add new goals as needed. Soon after embracing this new routine, my brain fog lifted! I was preparing for work projects and events with creativity. I was evaluating constructively. I was much better prepared for meetings. I learned how to say no to the things that were not essential. My clearest and deepest thinking now goes to the most important things. All the components of my job — including answering all those emails — were better balanced and more successful because of essentialism. My husband and I read Essentialism together and we both realized one thing needed simplification in our lives: the shopping situation. I love grocery shopping, cooking, and food in general. I like certain products and produce from certain places. At the height of my non-essentialism living, this meant multiple trips to Costo, Trader Joe’s, Aldi, and the local farmer’s market over the course of a month. We had too many priorities when it came to food shopping. Getting the best price, shopping local, and buying bulk are all good things, but shooting for all of them at once was a drain on time and energy. Furthermore, the food shopping priorities were taking away from a more important priority — quality time together on the weekend! So we applied essentialism to our food shopping. With some organization and plans for meal prep, we simplified to a large shopping trip every other weekend. In between the large trips, we do a quick trip for fresh produce. I let go of my store preferences. We are still eating delicious food and our weekends have more quality time with each other. Essentialism wins out again. Embracing essentialism comes with some challenges. Our busy and consumerist culture is the epitome of non-essentialism. The motto seems to be “Do it all and say yes to everything.” I often feel like I am swimming against the tide. Yet I keep swimming because I have found great freedom in this simpler, more intentional way of living. If any of this sounds appealing to you, I offer a challenge. Pick one area of your life and think about how you can apply essentialism to it. Give yourself a week or two to try it out. See if your life improves from discerning and simplifying — adding these practices are a concrete way to live with more intentionality.